Rachel Foullon, For Albany (Dickie), 2012, canvas, vintage Eastern white pine, dye, stain, hardware, 18’ x 18’ x 16’. Foullon’s “Cruel Radiance” series, 2011–12, consists of farmyard or household implements—an antique bucksaw, washboard, and seed sower—metamorphosed into Surrealist devices via strategically added pieces of nickel-plated brass, polished into guillotine-blade seductiveness and perfection. They are among the most striking works in the show, as they further estrange the near-dead functionality of these tools into a kind of funerary, hyperaestheticized sacredness. 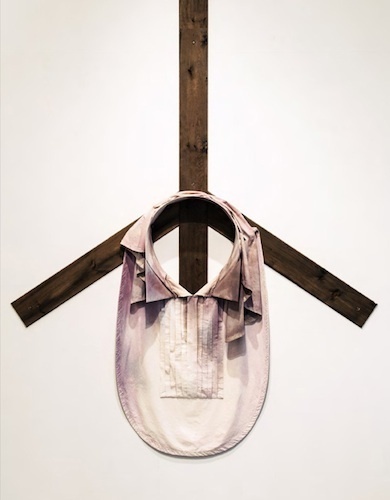 Also marvelous is the site-specific For Albany (Dickie): a Brobdingnagian formal dress collar—the kind working-class men of the late nineteenth century might’ve worn to a Sunday service—made from canvas, dyed in smoky, pewter-rich grays, and hung upon an inverted, broken cruciform shape made of white pine. It is a visually immersive piece that takes some of its formal cues from Robert Morris’s felt sculptures and Beverly Semmes’s wraithlike dress works. Foullon bears out in this show what many of us fear, perhaps more now than ever before: that our lives of überconvenience and overleisure will deaden our sense of what constitutes real risk, real purpose, and genuine survivalnamely, a life worth living.